One of the wide-format models of Genaray's Professional Series of on-camera lights, the LED-6800 offers a bright, soft light output, spread 10" across. It's compact and lightweight and perfectly suitable for on-camera applications, and is just as ideal for AC-powered, continuous studio setups. It's daylight-balanced at 5800K color temperature and features 256 LEDs that deliver 1900 lux brightness at 3 ft. Brightness is dimmable and flicker-free from 100-10%. Both color and brightness are adjustable by stepless, smooth-tuning dials on the rear. The LED-6800 is stackable vertically with additional LED-6800 units and also with Genaray LED-7500T units via integrated shoe mounts, allowing you to expand a single light source, especially useful for in-studio productions. A slide-in diffuser and slide-in 3200K warming filter are included for softening the light output and creating a warmer look. The LED-6800 can be powered by an included NP-F750 battery, included AC adapter, or any other Sony L Series battery. An indicator light on the rear turns on when remaining battery life reaches low status. An AC/DC battery charger and tilt and swivel ball head are also included. The ball head features a shoe mount that can be removed to reveal a 1/4"-20 thread for mounting and adjusting the light on stands. Box Dimensions (LxWxH) 14.3 x 9.45 x 2.8"
LED-6800 256 LED Daylight-Balanced On-Camera Light is rated 4.2 out of 5 by 44. Rated 5 out of 5 by victorious from update: from 3 to 5 stars so, I am a bit embarrassed, but right is right. I gave this 3 stars - not because of the light itself, but because of what I thought was flimsy manufacturing of the battery slot. Well, I was wrong. It was user error. I don't want to explain because I don't want you all to laugh at me as much as I am laughing at myself. I'm glad I did not return this wonderful (and it is wonderful light - and I do suggest you do buy it).side note, i wish the dimmer was placed in a different place, but seriously great light for the price. Rated 4 out of 5 by Edwards from Afordable, Portable, and Worth It! The LED-6800 is an incredible piece of kit considering the price. Not only is it lightweight but extremely versatile and compact. Battery power gives you the freedom to take this light anywhere. We often mount it to a boom poll with the included ball head for on location shoots. Plus the included battery lasts hours. The dimming function and slide on filters are a perfect touch. 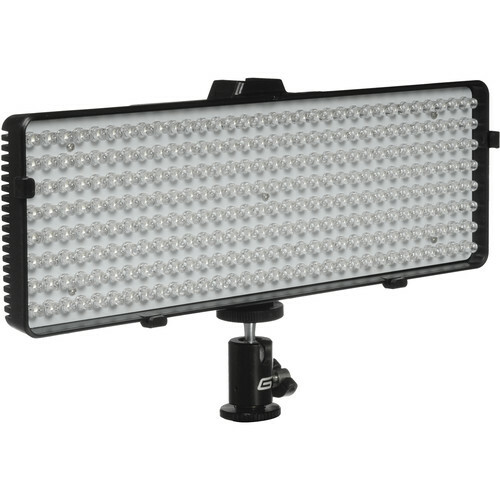 This is truly a great and affordable light for photographers as well as filmmakers. The output is very impressive for such a small fixture. If you're on a budget these are a good way to go! Rated 4 out of 5 by Interview shooter from A good buy! I feel like the LED-6800 was a good buy. I shoot interviews and this is perfect for the run and gun approach. You will get plenty light at 3-5 feet and it is dimmable. You might want a back light for more detail in the hair etc but you can usually find a good place to setup where you have some ambient light. No problem with the clip, I have another that I use that works great if you don't need to tilt it. It is very light but be careful. I cut out a space in my flight case. I like that it works with Sony L batteries which I use for my camera. I have extra chargers that are better so I'm not concerned with the one that came with this. I'm excited to try some other filters! I may buy another for more lighting options.. Rated 5 out of 5 by Mario from Great for 16:9 video This lamp has something that other doesn't have: wideness, I mean if you're filming for widescreen this lamp illuminates very well all the area through the left & right edges, avoiding the vignetting effect. Also it comes with color correction filters, battery and charger. Very good for the price. Rated 5 out of 5 by Realtor Richard from A great light As a realtor and former photographer, I like to do my own photos of clients' homes. I needed a light that could go anywhere and light up a room. The LED-6800 by Genaray is perfect: bright, wide and doesn't generate heat. I haven't been in a house yet where the battery ran out of juice. The ball mount isn't as strong as I'd like, but so far it works, and I'll use it for a backup after I buy another. Rated 4 out of 5 by Votawgrapher from Very Bright I have only had this product for little over a day at this point but I think I've already found out pretty much all there is to know about it. The lights are all nice and even and it is definitely a bright light. I have, however found several things that could use more engineering. The incandescent filter seems way too orange, but the filters do fit into the front of the light nicely. The bracket on top of the light would seem very good for extending more of this brand's lights, but DON't put anything else in there or it might get stuck on the clip. The little ballhead is a nice inclusion but can easily become loose with any motion. The knobs on the back of the light work pretty well but are too close to the battery and therefore a little difficult to work. I think a switch or push button would work better for turning it on and off. Changing the brightness works well. It is very light and has good battery life.